Polybit CM16 ... for wet areas and swimming pools. Based on a slip control formula, the new adhesive offers many advantages, says Valentina Podocea, the brand manager for Henkel Polybit’s UAE office. Its non-slip formula makes it perfect for walls and for wet areas such as bathrooms, kitchens and toilets and it’s the unmatched solution for swimming pools, Podocea says. Other areas where it is suitable for are utility rooms such as cellars, storerooms, drying rooms, corridors, stairs, anterooms, living rooms, parking, balconies, and terraces. 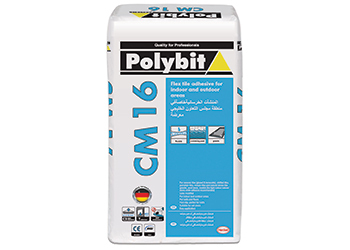 Polybit CM 16 can be applied to cement and cement-lime plasters, cement screeds, cement ground coats, and concrete substrates. It can also be used on lightweight autoclaved aerated concrete (AAC) blocks, concrete blocks and wood–cement boards as well as sound-deadening panels, gypsum boards and anhydrite substrates, when primed with Polybit CT 17. Further application avenues include deformable substrates, such as primed plasterboards, wood chip-boards, heated floors, large tiles (less than 0.36 sq m) and higher loads; and Polybit flexible sealing materials like Polyflex and CL51. The CM 16 has been tested according to EN 12004 and conforms to ANSI A118.4. The product is a top class adhesive among the portfolio of tiling products launched by Henkel under the regional Polybit brand in the UAE. This line covers a wide range of products, from adhesives and primers to grouts and sealants and delivers sustainable value for consumers, professionals and industries, says Podocea. She attributes the outstanding quality of Polybit tiling products to the company’s in-house technologies and tailor-made solutions. Germany-headquartered Henkel is renowned worldwide for leading innovative brands and technologies in adhesives technologies, beauty care, laundry and homecare. The Adhesive Technologies unit forms an integral part of its portfolio, providing tailor-made solutions in adhesives, sealants and functional coatings for consumers, craftsmen, building applications and industrial sector. The unit has a strong, well-balanced portfolio of international, regional and local brands, offering a multitude of applications to satisfy the needs of different target groups and different markets. She says Henkel is one of the few companies in the industry to produce its own formula of polymers for tiling adhesives. Workability, open time, slip resistance and durability are few of the attributes that craftsmen all over Europe are associating with Henkel tiling solutions. It comes as no surprise that 9 out of 10 craftsmen in Europe recommend Henkel tiling products, which only reinforces that fact that Henkel products are efficient, strong and reliable.